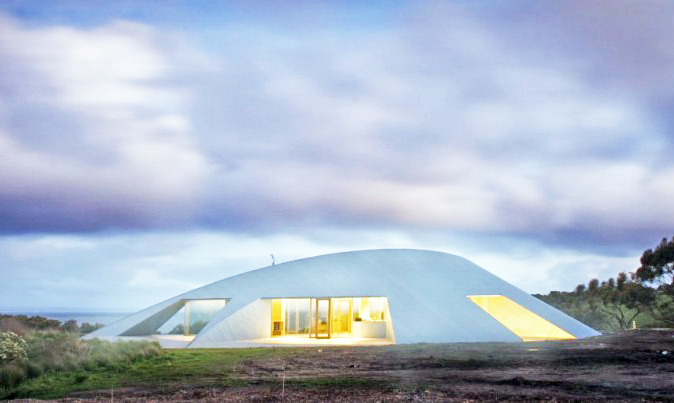 The owners of a particularly pristine piece of land in Inverloch, Australia commissioned James Stockwell to design them a new home. Their brief emphasized two important design considerations: provide coastal vistas from every direction and ensure that the house is in sync with the incredible natural environment. Stockwell responded with a low-lying home that hovers like a spacecraft, and it boasts a host of innovations that minimize its overall footprint. 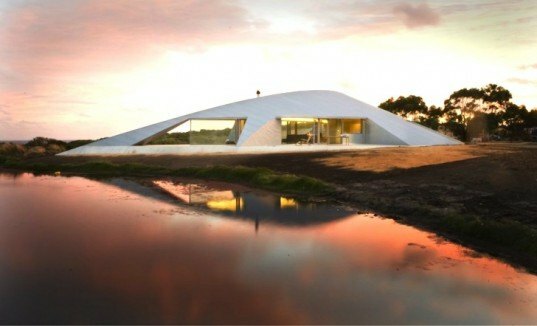 James Stockwell exploited three sine curves to create the home’s unique form, while relying on low embodied energy materials to fit in with the vernacular architecture of Victoria’s south coast. Concrete mixes with corrugated metal to match the landscape’s neutral colors, while compressed sand walls provide plenty of thermal massing. Double glazing allows natural light to penetrate the interior and passive solar design limits summertime solar gain and maximizes the same in winter. The interior structure and joinery was constructed with ash timber, which was sourced locally, and the wet areas were constructed with bluestone, which was also sourced locally. It’s a beautiful design that shows complete reverence for the pristine coastal landscape. Every corner of the house has a coastal vista, per the owners' brief.